traditional side of the fence. They include a Ethiopian-Israeli jazz funk vocalist; a veteran trumpeter leading a group that will mix jazz and Krunk and finally a young trumpet star who has for the past decade been a leader in the fusion of jazz with 21st Century musical styles. Purists may turn-up their noses but I think that Saturday has the potential to be one of the most musically compelling days on the AJF Main Stage in a long while. 1:00 pm The Tri-Cities High School Jazz Band – The Youth Jazz Band Competition allows young jazz musicians from all over the metropolitan area the opportunity to showcase their talent. Three winners are selected to receive a financial contribution to their music program and a guaranteed spot to perform on the Atlanta Jazz Festival Main Stage. The Tri-Cities High School Jazz Band finished second in the competition and will open the Main Stage performances on Saturday. 3:00 pm Rialto Youth Jazz Orchestra – The Rialto Youth Jazz Orchestra was founded in the June 2011 by its Director, Dr. Gordon Vernick. The RYJO program consists of 1 large jazz ensemble and 5 jazz combos. Last year participating high school students came from the following counties: Fulton, Cobb, Dekalb, Gwinnett, Clayton, and Fayette. The students are selected through auditions. 5:00 pm Ester Rada – Ester Rada is an Israeli born Ethiopian vocalist whose sound “gracefully combin[es] Ethio-Jazz, Urban-funk, Neo-Soul and R&B, with mixed undertones of black grooves”. Growing up in a highly religious Jewish family in modest conditions in Israel, gave Rada the drive to change her way of life and fulfill her dream of creating music. the release of her self composed/produced EP, Life Happens, last year. The tracks that make up Life Happens also appear on her recently released eponymous full length project. Ms. Rada names Nina Simone, Aretha Franklin, Erykah Badu and Lauryn Hill as her major influences and I hear traces of all of those divas in her performances. People may argue about her “jazz cred” but frankly, I don’t give a damn, she is exciting to listen to and watch. Be there! 7:00 pm Russell Gunn’s Krunk Jazz Orchestra – Mr. Gunn is a veteran of many appearances at the AJF and he consistently surprises us every year with a new and interesting twist to his sound. This year Russell Gunn brings us the Krunk Jazz Orchestra, an aggregation that is likely intended as an amalgam of various jazz styles with that beat driven synthesizer heavy style of hip hop, known as “Crunk” (or “Krunk”) that is popular in the South. Gunn’s 2006 album Krunk Jazz should give you an idea of what to expect when he hits the stage. I know that I (and many others of a certain age) will need Icy Hot or a similar type of product on Sunday as a precursor to the visits to the chiropractor that we will all need next week from all of the spontaneous and violent head nodding that we will engage in while Gunn drops his groove. It will be well worth it. 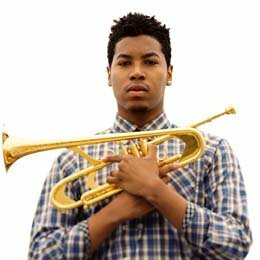 9:00 pm Christian Scott – Though Christian Scott is not a known purveyor of “Krunk Jazz”, per se; he definitely works the same side of the street as Mr. Gunn, favoring musical styles that owe as much to jazz traditions as they do the sounds of hip hop and other currently popular musical styles. Mr. Scott, who now also goes by the name Christian aTunde Adjuah (in tribute to his ancestors), set the jazz world on fire in 2006 with the release of Rewind That, his major label debut. Rewind That was exciting because so many things were happening on each track. You heard Scott’s deep New Orleans Jazz roots, his Milesian influence, a bit of Coldplay style rock and an insistent hip hop based underpinning. Each was fighting to be heard and when all elements hit at the same time, something totally fresh and new happened. Mr. Scott has continued down that stylistic path on most of his subsequent recordings. He has never let go of what he learned from his mentors such as his uncle saxophonist Donald Harrison, but he has also definitively refused to let himself get stuck in a retro-jazz rut. His most recent recorded project, Christian aTunde Adjuah, is a 2 disc set that has given Scott the space to bring many of his new “stretch music” ideas to the forefront. I’m sure we will hear some of those on Saturday night. And I will make every effort to avoid spontaneous eye infections and catch this set, unlike 2011. This entry was posted on May 22, 2014 at 4:15 pm and is filed under Atlanta Jazz Festival 2014 with tags atlanta jazz festival, Atlanta Jazz Festival Main Stage, Atlanta Jazz Festival Main Stage Schedule, atlanta jazz festival piedmont park, christian scott, ester rada, Krunk Jazz Orchestra, russell gunn. You can follow any responses to this entry through the RSS 2.0 feed. You can leave a response, or trackback from your own site.